Can you believe it? The electrons you are perusing this very moment mark the third anniversary of the Silver Age Sage. Three years and 72 reviews and I'm still having an utter ball with it. I'd like to thank our readers, both old and new, those who take the time to drop me a line with comments or questions and above all my oldest and dearest friend, the webmaster for giving me this forum and opportunity. Great things lie in the future, so stay tuned. We intend to be here for a long time to come. I was up late with my daughter recently, watching mindless television when, on Cartoon Network, an episode of the Super Friends came on. I chortled to myself that it made sense, it being after midnight on a Saturday that they'd trot out that old dog. To my surprise it was an episode I didn't know existed and while it's hard to get past the truly cartoonish nature of that series (not to mention Robin sounding an awful lot like Shaggy from Scooby-Doo fame) I was rather intrigued at the lineup for the Legion of Doom. I didn't know that many of the following classic Silver Age characters had made an animated appearance prior to the current Justice League series: Solomon Grundy, Bizarro Superman (complete with backward "S"), the Riddler, the Scarecrow, Sinestro, Toyman (in a goofy uniform and even goofier voice), Brainiac, Black Manta, Lex Luthor in his purple battle suit and Super Gorilla Grodd. I've got to admit, I was impressed. Even better, no sign of the Wonder Twins or Super Marvin. It just served as yet another reminder that even in a campy setting like the Super Friends, the grouping of a team of heroes and/or villains almost inevitably makes for a great story. With that, I'd like to introduce you to my selection for this milestone edition of the Sage. It was a pretty easy pick, actually and I think it exemplifies the best of the era. 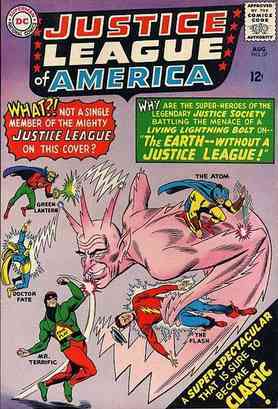 Join me now for a nother magnificent pairing of the Justice League of America and the Justice Society of America in a terrific two-issue tale that starts with JLA #37 entitled "Earth Without a Justice League!" This issue hails from August of 1965 with cover art courtesy of Mike Sekowsky and Murphy Anderson with lettering by Joe Letterese (honest!) Interior architecture was provided by Julius Schwartz, editor; Gardner Fox, writer; Mike Sekowsky, pencils; Bernard Sachs, inks; and Gaspar Saladino, letterer. Note the catch on the cover. Not one member of the JLA is on it. It's all JSA and as they'd been doing, our writing team was gradually introducing different members of the JSA for their annual appearance in the Justice League's magazine. In this case, Mr. Terrific is an obvious newbie. The rest of the roll call from the splash page includes the Atom, Doctor Fate, Flash, Green Lantern and Hawkman. On to our story. We join one Johnny Thunder, who has just received a special delivery letter inviting him to attend a meeting of the revived Justice Society of America, where he'd been an active participant in the past. Johnny promptly summons his Thunderbolt via the Bahdnisian hex words "Cei-U," pronounced, "Say you." Apparently he and this living lightning bolt had a spat and the Thunderbolt suggests he was looking at greener pastures. Johnny reminds him that he controls the Thunderbolt and his options are limited. Thunderbolt retorts that he could go to Earth-One where that Johnny Thunder might be a better master. Johnny thinks aloud that he'd like to meet his counterpart and the Thunderbolt immediately obliges his wish. Johnny finds himself in a seedy apartment with an equally seedy version of himself. The Earth-One Johnny Thunder is a small time hood and he recognizes the Thunderbolt as he was also raised by the Bahdnisians, but wasn't assigned one. He takes the opportunity to clock Johnny and assumes control of the Thunderbolt, promptly ordering him to rob one of the local payrolls by invoking the "say you" command. It seems the Bahdnisian bolt is something of a literalist, too. Johnny told him to "hop down" to the company, so the Thunderbolt does exactly that. As he tears open the safe, he's spotted by Barry Allen, who d oes a hurried change into his alter ego, the Flash. As he confronts the Thunderbolt, Johnny's protégé reveals who he is to The Fastest Man Alive. "Sure, that's it! I read about you in the old Flash comics—in the Johnny Thunder stories that took place on Earth-Two! But what are you doing here—robbing a safe?!" Unfortunately, Flash's question will be unanswered for, at that moment, an impatient Johnny Thunder summons the Thunderbolt back. Bolt explains that he'd encountered the Flash, which gets Johnny's mind to working. He then makes a momentous decision and orders the Thunderbolt to go back in time to prevent the Justice League from becoming super-heroes. Compelled to obey, the Thunderbolt immediately undertakes the task, starting with an appearance in Central City, where he deflects a bolt of lightning that would have struck a wall of chemicals in a laboratory, creating The Flash. Next stop, deep space and the planet Krypton, where the Thunderbolt alters the planet's core, precluding the instability and resulting explosion that sent an infant Kal-El to Earth. Another rapid space flight leads back to Earth and the Bahdnisian Bolt stops the radiation from stunning Abin Sur so that his flight doesn't lead to a crash-landing and he remains the Green Lantern of his space sector. Then another space journey is completed to smash a white dwarf star fragment destined to land in an Ivy Town meadow, where Ray Palmer would discover it and use it to become The Atom. His mission as spoiler continues and the Thunderbolt next appears at the laboratory of one Dr. Erdel. The bolt short-circuits the robot brain and stops J'onn J'onzz from arriving on Earth to begin his career as the Martian Manhunter. Gotham City is the next destination, where the Thunderbolt helps two criminals defeat Batman on his first attempt at crime fighting, discouraging Bruce Wayne from this new path. In time, all the other members of the Justice League, Green Arrow, Hawkman, Wonder Woman and Aquaman are similarly interfered with, keeping them from their heroic end states. An exhausted Thunderbolt reports to his new master that his task is complete and warns the wicked Johnny Thunder that the Earth has been altered. 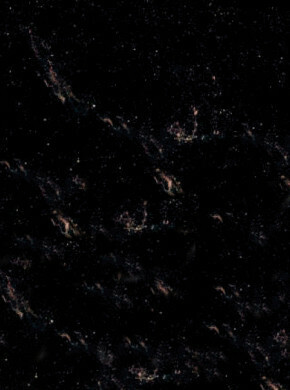 Non-plussed, Thunder declares it to now be Earth-A, for alternate and that he will now clean up. Part II opens at Justice Society headquarters where a gathering of six heroes including the Atom, Flash, Hawkman, Green Lantern, Mr. Terrific and Doctor Fate begin to wonder where Johnny Thunder might be. Doctor Fate soon consults his crystal ball and the Society members discover Johnny, unconscious and unaccompanied by his Thunderbolt, on Earth-One (or Earth-A, if you will). They then discover the other Johnny Thunder with a group of miscreants, plotting a series of robberies and boasting that no super-heroes stand in their way. The amazed members of the Justice Society waste no time in making their way through the space-time continuum to help set things right on the alternate Earth. The heroes arrive just in time to avert a robbery. While Johnny had instructed the Thunderbolt to put up a barrier to keep the law away, it didn't stop the Justice Society. The Thunderbolt reminds Johnny that he follows all orders to the letter. While the heroes mop up his gang, Johnny tells the living lightning to kill the JSA, but the Thunderbolt says that is the one thing he cannot be commanded to do. Johnny then says for him to slap them down, so the Thunderbolt forms himself into an enormous hand to do just that. This dazes the heroes for a moment, but of course it wasn't what Thunder had in mind so he tells the Thunderbolt to do something. "Sure—boss—but what? Remember, you must tell me what to do! I'm no mind-reader!" The slow-witted Johnny then instructs the bolt to kick the JSA off the Earth. Forming his body into a large boot, he does so…kicking them about 10 feet off the Earth. Doctor Fate, meanwhile, has sent out bolts of his own Chaldean magic to protect his fellow Society members prior to a combined assault on the Bahdnisian hex bolt. The frustrated Thunder then tells the Thunderbolt to transport them out of there. The Justice Society members then grill Johnny's gang and discover no one has heard of any of the JLA members. The heroes decide to find their counterparts and try to get to the bottom of things. Soon, the Flash is speaking to Barry Allen; Green Lantern meets up with Hal Jordan and the Atom finds Ray Palmer, but the story is the same. No events have transpired to create their namesake heroes. Doctor Fate has discovered meanwhile that "their" Johnny Thunder is in a coma. Upon comparing notes the Justice Society hatches a plan. To get to the bottom of things, they' ll impersonate the Justice League and take on Johnny Thunder. Part II closes on that note. Things take off in fine form for Part III as the JSA transforms, with the able assistance of Alan Scott's power ring and Doctor Fate's magic, into their counterparts, in the case of Green Lantern, Atom and Flash, and reasonable facsimiles when Hawkman becomes the Martian Manhunter, Mr. Terrific assumes the mantle of the Batman and Doctor Fate takes a turn as Superman. Off they go to locate the evil Johnny Thunder and his captive Thunderbolt. Meanwhile, back at the hideout, Johnny hatches a new plan and instructs the living lightning to take him to a luxury liner where they'll relieve the wealthy passengers of their valuables. No sooner do they arrive on deck, however, than the apparent Justice League make their appearance, much to Johnny's dismay. He rapidly orders the Thunderbolt to divide into six duplicate entities to do battle with the heroes. The fatal flaw in Thunder's plan, however, is that each Thunderbolt is only 1/6 the strength, so he is no match for each of the heroes he engages with. Despite a brief seesaw battle, it's obvious even to the stubborn Johnny that his hex bolt is being defeated, so he instructs it to regroup and retreat. As they fly away, Johnny asks the Thunderbolt if they were the Justice League and he learns their real identity as disguised members of the Justice Society. This gives Thunder yet another brainstorm and he instructs the Thunderbolt to release six of his cronies from prison and take them back through time and space to place them in the circumstances that created the members of the Justice League. Soon the Flash, Atom, Martian Manhunter, Superman, Green Lantern and Batman again exist, but with a very different mission statement. Johnny explains that they're to report directly to him under threat of his Thunderbolt. As luck would have it, the JLA garbed JSA break into the hideout and Johnny introduces his gang. He then commands the hex bolt to remove the disguises of the JSA and rings the bell for round one. Our editorial staff chooses that moment to end book one of the story. Next up, Justice League of America #38 and "Crisis on Earth-A!" 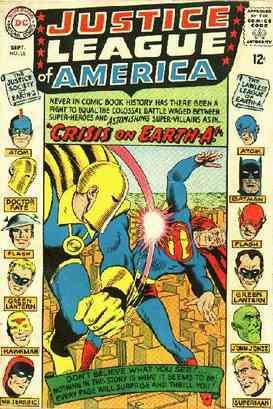 As you can see, this cover must have caused a bit of a stir at the comic rack with Doctor Fate clocking a blond, butch-haired Superman and the Lawless League of America displayed with such touches as a stubbled Batman, mustachioed Flash, lantern-jawed J'onn J'onzz and Green Lantern with widow's peaks. The story starts with Johnny Thunder being whisked carefully away to a safe haven with his own big screen to watch the battle royal. As one might predict, the Green Lanterns are in a dustup, as are the Flashes and Atoms while the Martian Manhunter and Hawkman are dueling and Superman with Doctor Fate. Initially, the battles are a dead heat, but the Justice Society of America has two significant advantages that become quickly apparent: Years of experience with their abilities and an intimate knowledge of the limitations of their adversaries. Witness the liberal use of magic by Doctor Fate against "Superman," a conjured yellow fist by Alan Scott and a fire created by Hawkman to subdue the "Martian Manhunter." The Atom removes the devices from the Tiny Titan that give him his powers and Jay Garrick uses his blinding speed in ways that the crooked "Flash" did not expect. The final match up between "Batman" and Mr. Terrific demonstrates the capabilities of the Man of a Thousand Talents, when he successfully stops in mid-stride to avoid some instant glue flung from the utility belt and slips into an aerial double somersault resulting in a left hook to the Masked Manhunter's jaw. Game over. Part II brings the Justice Society back together, along with their defeated "JLA" foes. Doctor Fate calls upon his formidable magic to learn how they came to be. After learning the origin of these thugs, they prepare to take them back into the past to set things right, but Johnny Thunder isn't finished yet. Invoking the "Say you" command, he orders up a series of natural disasters against the Justice Society, including a super hurricane, followed by a devastating earthquake. By working together as a team, however, the members avert personal disaster and the six champions of justice come through, more determined than ever to put a stop to Johnny Thunder. Still monitoring them, Johnny begins to panic and orders the Thunderbolt to transport him to the moon so he can think of another plan. He does have the presence of mind to ask for a spacesuit first, but upon arrival at the lunar surface, he realizes he cannot order the Bolt without air. He scrawls a command in the dust of the moon to put an atmosphere on the satellite and continues to plot. Back on Earth, the JSA goes forward with their plan to restore the JLA, but they discover that they cannot undo the magic of the Bahdnisian bolt. They conclude that their only alternative is finding Johnny Thunder and getting him to reverse the mischief he's caused with the help of the Thunderbolt. Flash mentions that he noticed an odd funnel of air whirling away from the Earth, so the Society investigates and follows it to the moon, where Johnny is busily concocting yet another wicked scheme. He instructs the Thunderbolt to create three formidable super-beings of his own design: Medusa-Man, whose face changes those who gaze upon it to wood; Absorbo-Man, with the ability to absorb powers used against him and turn them to his own adva ntage; and Repello-Man, who can repel forces hurled against him and back at the attacker. Part III of the Crisis on Earth-A opens with the arrival of the Justice Society on the moon, where Johnny lies in wait with his three giant super creatures and the reluctant Thunderbolt standing by in reserve. Unfortunately our heroes take a couple of casualties when Medusa-Man steps from behind a rock and turns the Atom and Mr. Terrific into wood. Reacting to the threat, Doctor Fate uses radar-directed magic lightning to place a blank, protective mask over the face of Medusa-Man, neutralizing him. The Flash and Hawkman then take on Repello-Man in a double-teaming action. Flash kicks up a dust storm with his rapid arm movements while Hawkman attacks with his mace from above. It is for naught, however, as Repello-Man's powers kick in and the dust and mace are turned back on our heroes, who fall at his feet unconscious. Green Lantern has decided to take his fight to Absorbo-Man and is also overcome when the force of his power ring is flung back at him. Johnny Thunder is ecstatic that only Doctor Fate remains and two of his three super creatures are standing unscathed. His victory dance may be a bit premature, however, as the Master Mage takes a calculated risk. He causes the wooden forms of the Atom and Mr. Terrific to slam into Absorbo-Man and it causes him to literally crumble to pieces. It seems that when Absorbo-Man absorbed GL's power, he also assimilated his weakness for wood. On to Repello-Man. Doctor Fate fires a massive charge of magic at the creature and when he begins to repel it, he explodes with calamitous force. Fate had used reverse magic on Repello-Man, causing the repelled for ce to come right back at him. Johnny is now beside himself and shrieks at the Thunderbolt to fight Doctor Fate until he wins in a magic brawl and free-for-all. The energy bolts begin to fly furiously and as the awesome power is unleashed, Thunder finds himself in a very bad position. The destruction is throwing him around like a rag doll in a storm, with bits of moon rock, dust and debris choking and hammering him and sending him flying across the jagged, unforgiving landscape. Finally, Johnny has had enough and screams his final command: "Say you! Thunderbolt! STOP!! I wish none of this had ever happened! I wish everything was back the way it was before I saw you—and that I never you again the rest of my life! Says me!" In the blink of an eye, his command is granted and we are given a couple of glimpses into respective headquarters. First the JSA, where Johnny Thunder has just arrived for his first meeting with the re-formed JSA. Also, on Earth-One, the JLA is holding a regularly scheduled meeting. Things are quiet, but Superman mentions a brief item about a small-time crook named Johnny Thunder while Flash muses that the name sounds familiar. The final panel is the Thunderbolt, speaking to the readers: "We know what happened, reader—but nobody else does! And I'm not going to shoot off my big mouth to tell anybody—for what they don't know won't bother them! How about you—will you keep my secret?" The success of the JLA/JSA team-ups led to it being an annual event during the Silver Age and the readership eagerly anticipated each two-part tale. The stories were nearly always of a superior quality and the rotating lineup of the Justice Society was a particular high point as a new generation was reintroduced to a classic character. In this particular case, we were shown both Johnny Thunder with his magical Thunderbolt and of course Mr. Terrific, though we didn't get to see much of his Thousand Talents brought into play. One of the things that really appealed to me was the history lesson dished up as we got to see some familiar origin tales of our favorite Justice League heroes. You can see many of them right here in the Sage archive as well. Another magnificent effort by the great Gardner Fox and company and it easily earns my top rating of 10. A very worthy way to recognize the third anniversary of this feature. I'd encourage you to read it for yourself when afforded the opportunity. I'm sure you'll find it as satisfying an experience as I did. Remember to catch the next bi-weekly review here at The Silver Lantern in which we will take another glimpse into the heyday of the DC Silver Age. I'll continue to monitor my electronic mailbox for notes from you. Drop me a line anytime at silveragesage@thesilverlantern.com.